Wayne Rooney's 10th goal of the season condemned Newcastle to a seventh defeat in eight Premier League outings as the home fans prayed for Mike Ashley's exit from St James' Park. Rooney pounced on goalkeeper Karl Darlow's 27th-minute error to stab home the only goal of the game in a first half which saw the Magpies, who had Jonjo Shelvey sent off in stoppage time, hit both posts. Rafael Benitez's men enjoyed the better of the game for long periods in front of a crowd of 51,042, many of whom arrived having read reports that prospective owner Amanda Staveley is close to agreeing a B#300million deal with owner Ashley to end his controversial 10-year-plus reign. But they left having seen Sam Allardyce, who was sacked by Ashley in 2008 after just eight months in charge, extend his unbeaten start as Toffees boss to four games with a 1-0 win. Just as they had done against Leicester on Saturday, the Magpies started positively and pinned the visitors back inside their own half. Midfielder Matt Ritchie saw a second-minute free-kick deflected just wide after DeAndre Yedlin had been tripped two feet outside the penalty area and both Javier Manquillo and Ritchie drilled crosses across the face of Jordan Pickford's goal. Idrissa Gueye should have done better when he sliced a 12th-minute shot harmlessly off target after good build-up play between Jonjoe Kenny, Aaron Lennon and Gylfi Sigurdsson, but the momentum remained largely with the Magpies. Ritchie, who had earlier seen Pickford field his snapshot, was unfortunate not to open the scoring when he latched on to Ashley Williams' 25th-minute clearing header and smashed a shot against the post. His disappointment was compounded within two minutes when Darlow spilled Aaron Lennon's downward header and Rooney bundled the ball home from close range. Suspicions that Newcastle's luck was out were confirmed with 37 minutes gone when Mikel Merino's 30-yard piledriver left Pickford grasping at thin air, only for the ball to come back off the other upright and fly across goal before running to safety. Darlow gratefully plucked a Sigurdsson header out of the air and Pickford claimed Dwight Gayle's low shot as the half drew to a close with Newcastle aggrieved not to be on terms. 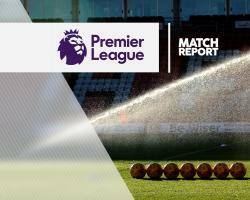 The home side resumed in determined fashion and Gayle saw a shot blocked after Shelvey had broken down the right and Mohamed Diame only just failed to get a touch on Florian Lejeune's header at the far post inside the opening nine minutes of the half. Rooney blazed high and wide from distance as Everton attempted to stem the tide on the break and Sigurdsson was similarly wasteful with the Magpies committing men to the search for an equaliser. Darlow went some of the way towards redeeming himself with a good one-handed save to keep out Williams' 70th-minute header, but it was Pickford who had to get his bearings right to claim Christian Atsu's rising strike seven minutes from time as the visitors weathered a late flurry.